Radiesse is beneficial for immediately filling deeper wrinkles and folds and adding lift to areas experiencing volume loss for a more youthful appearance. 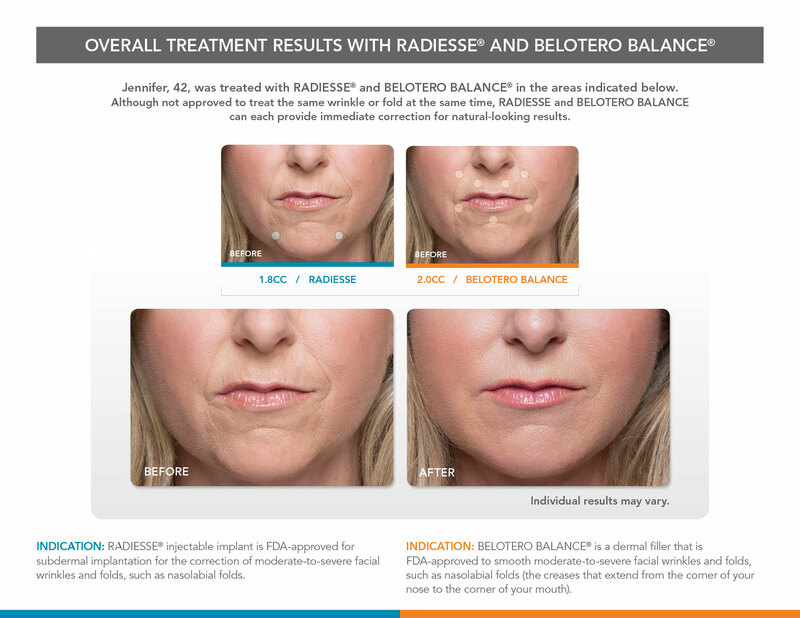 Radiesse and Belotero Balance can each provide immediate correction for natural-looking results. When a loss of facial volume causes folds and wrinkles to form, RADIESSE, a volumizing filler, offers a unique option—it adds an instant lift, smoothing out these signs of aging for a more youthful, natural-looking appearance that lasts. Treatments: RADIESSE and RADIESSE (+) are dermal fillers that are used for smoothing moderate to severe facial wrinkles and folds, such as nasolabial folds (the creases that extend from the corner of your nose to the corner of your mouth). Chin wrinkles , lines across your chinJust a single treatment of RADIESSE can be all you need to correct facial folds and wrinkles. Natural collagen is what gives skin a smooth, supple, youthful appearance. As you age, natural collagen breaks down and resulting in wrinkles and loss of facial volume. RADIESSE, a volumizing filler, provides an instant lift, filling wrinkles and folds to help restore a more youthful appearance. And it continues to work with your body, stimulating the natural production of collagen for a more refreshed appearance that can last up to a year or more in many patients. RADIESSE (+) is pre-mixed with an anesthetic called lidocaine for an enhanced treatment comfort. It is a robust filler that is ideal for restoring volume and smoothing wrinkles and folds in the lower face. When wrinkle or fold is treated to full correction. Individual results may vary. BELOTERO BALANCE integrates directly into the skin, enhancing your appearance with minimal downtime. 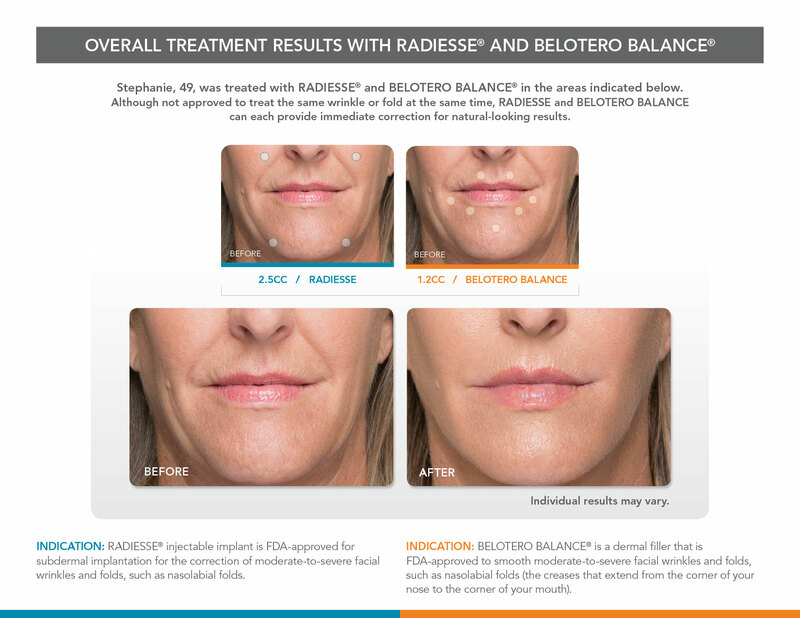 Radiesse and Belotero Balance treatments are a quick in-office procedure. Treatments are usually completed in about 30 minutes. Because little to no downtime is required, it’s likely you’ll be free to return to your regular daily routine right afterwards. And because the results are immediate, you can leave the office looking more refreshed. 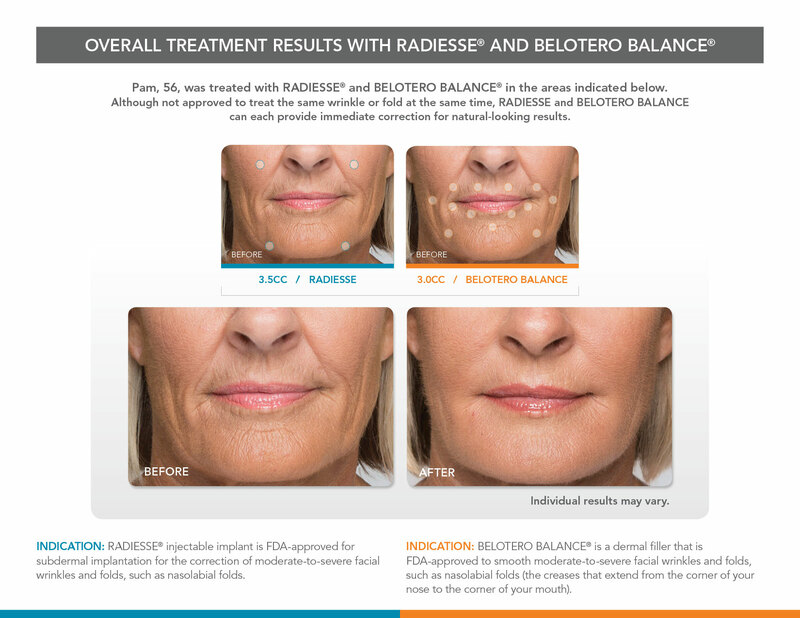 RADIESSE and BELOTERO Balance are dermal fillers that are FDA-approved to smooth moderate to severe facial wrinkles and folds, such as nasolabial folds (the creases that extend from the corner of your nose to the corner of your mouth). You should not use RADIESSE or BELOTERO Balance if you have a history of severe allergies or anaphylaxis, or if you are pregnant or breastfeeding. You should not use RADIESSE if you have an allergy to any part of the product, or if you have a bleeding disorder. You should not use BELOTERO Balance if you have an allergy to gram-positive bacterial proteins. If RADIESSE or BELOTERO Balance is injected into a blood vessel, serious complications can result including stroke, vision abnormalities, blindness, temporary scabs and permanent scars. The most common adverse events seen in clinical studies with BELOTERO Balance were swelling, bruising, redness, hardening of the skin, pain, altered color or itching. Other adverse events that have occurred with BELOTERO Balance include headache, swelling of the side of the nose, moderate cold sore, lip numbness, and lip dryness. Side effects were often mild to moderate and usually resolved within 7 days. The most common adverse events seen in clinical studies of RADIESSE® include bruising, redness, swelling, pain, itching and other local side effects. These are not all the possible adverse events with RADIESSE or BELOTERO Balance. For full RADIESSE or BELOTERO Balance safety information, please visit www.Radiesse.com, www.belotero.com, or call MyMerz Solutions at 1-844-469-6379. 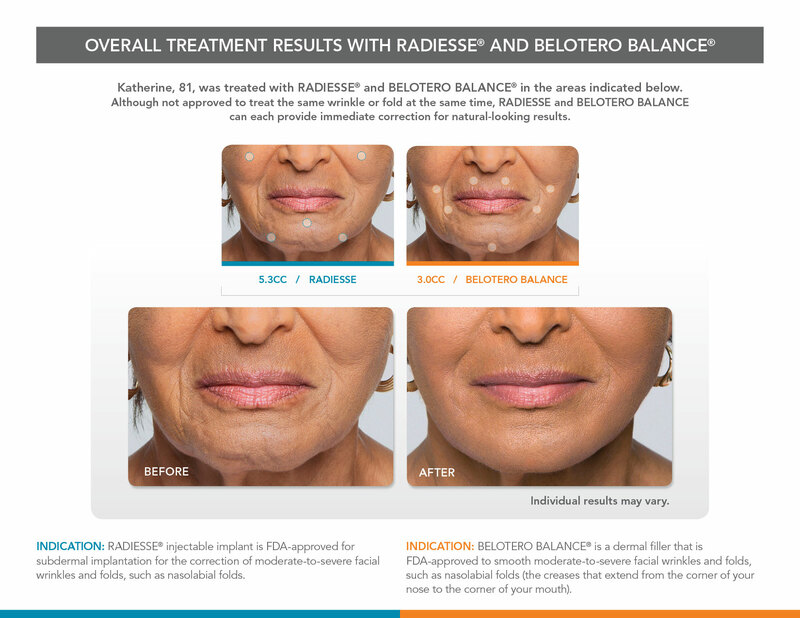 RADIESSE and BELOTERO Balance are available by prescription only.